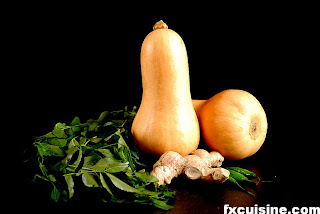 I love fall veggies, perhaps none more than all the varieties of squash available at this time of year. Last week, I posted a roasted cauliflower recipe (which I have made three times in the past two weeks and I intend to make again before this week is out.) Last fall, I posted a roasted butternut squash soup recipe that is one of my favorite soups of all time. Squash and pumpkin are used with pasta all over Italy, but particularly in the north, in places like Verona and Mantua, you find pumpkin or squash ravioli on every menu of every little trattoria you stumble into. I love pumpkin ravioli, but this is a much less labor-intensive way to pair pumpkin with pasta. It's a very simple recipe, but you need to start your prep about an hour before you want to eat, because you have to cook down the veg for a long time, so, be warned. Cut the onions in half longwise and clean. Then slice into thin half-moon shapes. Clean the squash with a veggie peeler. Again, cut in half lengthwise and clean out the seeds. Then slice into thin half-moon shapes. In a deep sautee pan or a soup pot (I use a soup pot), over high heat, add some olive oil, then the onions and a pinch of salt. When the onions are soft and starting to brown, add all the squash, then reduce the heat to low. Add the sage. Continue to cook this way for about 35 minutes, stirring occasionally. Eventually, the onion and squash will become very soft and creamy and sort of melt into each other. At this point, bring another pot of water to a boil for your pasta. When the veg. are soft, put the squash into the food processor and give it a nice whirl. It doesn't have to be perfectly creamy, but you don't want huge chunks of squash, either. I let the processor go for about a minute. Return the squash to the pot, add a healthy grate of nutmeg, and a pinch of freshly ground black pepper. Continue to cook over low heat. As to the pasta, pumpkin sauce is often served with penne, but any short-cut pasta will do. Personally, I like something with a little bite to it, so I tend to use ligurian trofie. But if you don't have access to a good Italian market, penne works really, really well. When the water is at a rolling boil, add a big pinch of salt, then the pasta and stir well. When the pasta is about 5 minutes away from being done, add a healthy pinch of parmesan cheese and a dollop of cream or 1/2 n 1/2 to the sauce. Give it a stir and taste for salt. Remove about one-half of the sauce to a bowl and keep to the side. When the pasta is about a couple of minutes away from al dente, drain and add the pasta to the sauce. Cook about a minute. If you need more sauce, you've got some set aside. If you don't need the additional sauce, save it for another day. Serve with freshly grated parmesan and enjoy.